“Honey, he looks slippery as soap." Our essential bar soap recipes are unique formulas made with great devotion to both their intent or condition and their scent. Since they feel and smell wonderful they can be used to cleanse the body as you would any soap. 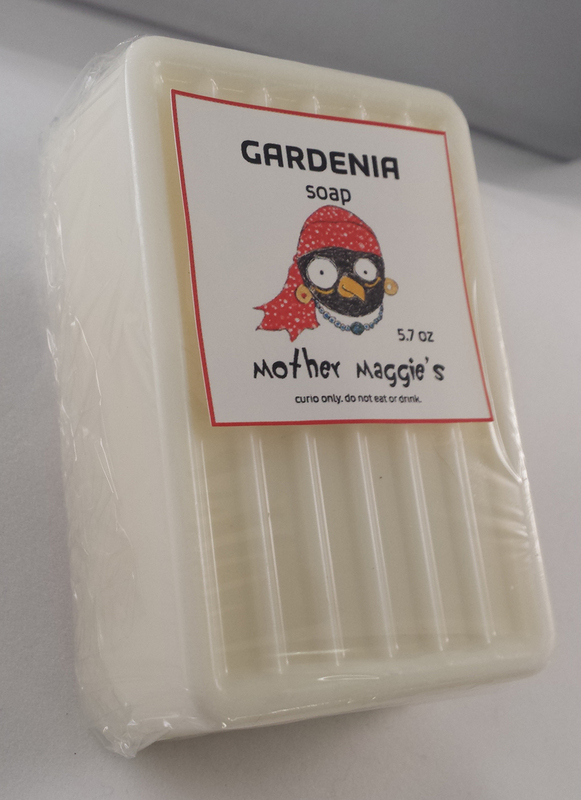 Mother Maggie’s essential bar soap is essential and fragrance oils in a white opaque soap base (Glycerine, Palm Oil, Coconut Oil, Lauric Acid, Water, Sodium Hydroxide, Sodium Lauryl Sulfate, Sorbitol, Triethanolamine, Salt, EDTA, Titanium Dioxide). All formulas are prayed over during creation. We use pure essential oils when possible. Our essential blend oils are pure essential oils combined to approximate specific essential oils that are either unavailable because of a shortage in nature or because the essential oil itself is too costly. Our fragrance oils are blends of both essential and synthetic oils for scents that are not available in nature or plants and woods that are unable to produce an actual essential oil, or for essential oils that are too costly. While Mother Maggie’s bar soaps are blended to be skin safe, and because specific essential oil allergies are possible, always skin test before use. Curio only. No claims or promises are made. For external use only. Do not eat or drink. Allspice fragrance oil can be used to help with relaxation, healing, success, luck, and money work. We use Allspice fragrance oil in our Lucky recipe. Amber fragrance oil can be used to help with courage, healing, love, success, and personal strength work. We use Amber fragrance oil in our Healing, Journey, and Mojo recipes. Bay essential oil can be used to help with relaxation, focus, personal strength, cleansing, protection, success, and psychic work. We use Bay essential oil in our Calm, Focus, Law, and Success recipes. Bayberry fragrance oil can be used to help with family, home, money, and job work. We use Bayberry fragrance oil in our Job and Money recipes. Bergamot essential oil can be used to help with love, money, commanding, personal power, and success work. We use Bergamot essential oil in our Done, Happy, Heart, Law, Lust, Mojo, and Reverse recipes. Calamus essential oil can be used to help with commanding, luck, healing, psychic, and protection work. We use Calamus essential oil in our Fidelity, Job, Mojo, Money, and Reverse recipes. Camphor essential oil can be used to help with cleansing, healing, clarity, protection, and psychic work. We use Camphor essential oil in our Reverse recipe. Cassia essential oil can be used to help with success, spiritual, money, job, and luck work. We use Cassia essential oil in our Job and Money recipes. Cedarwood essential oil can be used to help with healing, cleansing, money, protection, personal strength, psychic, and male energy work. We use Cedarwood essential oil in our Fertility, Journey, Lust, and Release recipes. Coconut fragrance oil can be used to help with cleansing, home, love, and protection work. We use Coconut fragrance oil in our Happy and Fertility recipes. Eucalyptus essential oil can be used to help with cleansing, healing, and protection. We use Eucalyptus essential oil in our Done recipe. Frankincense essential oil can be used to help with cleansing, protection, psychic, and spiritual work. We use Frankincense essential oil in our Blessing and Vision recipes. Gardenia fragrance oil can be used to help with love, healing, and spiritual work. We use Gardenia fragrance oil in our Happy and Heart recipes. Hyssop essential oil can be used to help with cleansing, healing, and protection work. We use Hyssop essential oil in our Cleanse and Release recipes. Jasmine fragrance oil can be used to help with love, tranquility, money, and psychic work. We use Jasmine fragrance oil in our Vision recipe. Juniper essential oil can be used to help with love, lust, cleansing, healing, and protection work. We use Juniper essential oil in our Lust recipe. Lavender essential oil blend can be used to help with happiness, healing, love, home, cleansing, and protection work. We use Lavender essential oil blend in our Calm recipe. Lemon essential oil can be used to help with cleansing, healing, protection, and love work. We use Lemon essential oil in our Cleanse recipe. Marjoram essential oil can be used to help with heartache, healing, love, protection, court, and legal work. We use Marjoram essential oil in our Law and Release recipes. Musk fragrance oil can be used to help with love and lust work. We use Musk fragrance oil in our Fertility and Lust recipes. Myrrh essential oil can be used to help with cleansing, healing, psychic, and spiritual work. We use Myrrh essential oil in our Blessing and Vision recipes. Orange essential oil can be used to help with love, luck, happiness, cleansing, psychic, and money work. We use Orange essential oil in our Journey and Lucky recipes. Palmarosa essential oil can be used to help with cleansing and luck work. We use Palmarosa essential oil in our Cleanse and Lucky recipes. Patchouli essential oil can be used to help with love, lust, money, fertility, cleansing, and protection work. We use Patchouli essential oil in our Heart and Safe recipes. Peach fragrance oil can be used to help with cleansing, healing, home, love, luck, wisdom, and mental balance work. We use Peach fragrance oil in our Focus, Happy, Nest, and Success recipes. Pennyroyal essential oil can be used to help with cleansing, home, relationship, personal strength, and protection work. We use Pennyroyal essential oil in our Nest recipe. Peppermint essential oil can be used to help with cleansing, protection, love, healing, and psychic work. We use Peppermint essential oil in our Journey and Safe recipes. Pine essential oil can be used to help with cleansing, healing, fertility, money, and protection work. We use Pine essential oil in our Courage recipe. Rose fragrance oil can be used to help with love, lust, luck, healing, psychic, and protection work. We use Rose fragrance oil in our Calm, Fertility, and Fidelity recipes. Rosemary essential oil can be used to help with cleansing, clarity, love, home, family, protection, personal strength, and lust work. We use Rosemary essential oil in our Nest recipe. Rosewood essential oil blend can be used to help with healing and spiritual work. We use Rosewood essential oil blend in our Calm, Focus, and Heal recipes. Sage essential oil can be used to help with wisdom, mental balance, blessing, cleansing, healing, luck, and protection work. We use Sage essential oil in our Focus, Job, and Success recipes. Sandalwood essential oil blend can be used to help with spiritual, cleansing, healing, luck, lust, and protection work. We use Sandalwood essential oil blend in our Blessing, Cleanse, Heal, Success, and Vision recipes. Spikenard essential oil can be used to help with love, lust, fidelity, clarity, and healing work. We use Spikenard essential oil in our Fidelity recipe. Vanilla essential oil can be used to help with love, lust, luck, and mental strength work. We use Vanilla essential oil in our Courage, Fidelity, and Lucky recipes. Vetiver essential oil can be used to help with love, fidelity, cleansing, protection, personal strength, luck, and money work. We use Vetiver essential oil in our Courage, Money, and Safe recipes.